Released on October 17, 2016. 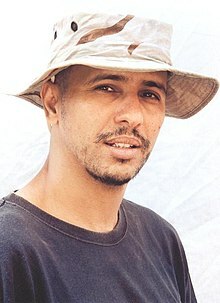 Mohamedou Ould Slahi (Arabic: محمدو ولد الصلاحي‎) (born December 21, 1970) is a Mauritanian who was detained at Guantánamo Bay detention camp without charge from 2002 until his release on October 17, 2016. Slahi wrote a memoir in 2005 while imprisoned, which the U.S. government declassified in 2012 with numerous redactions. The memoir was published as Guantánamo Diary in January 2015 and became an international bestseller. Slahi is the first detainee to publish a memoir while imprisoned. He was prohibited from receiving a copy of his published book. Slahi was held under the authority of the Authorization for Use of Military Force Against Terrorists (AUMF-AT), enacted on September 18, 2001. The U.S. government alleged he was part of al Qaeda at the time of his arrest in November 2001. Slahi lived in Montreal, Quebec, Canada from November 1999 to January 2000, during which the millennium attack plots were thwarted. Slahi was suspected of involvement in the attempted LAX bombing and was investigated by the Canadian Security Intelligence Service. Due to the scrutiny, Slahi returned to live in Mauritania, where he was questioned and cleared of involvement. After the September 11 attacks, the U.S. again was interested in Slahi. He turned himself in to Mauritanian authorities for questioning about the millennium plot on November 20, 2001. He was detained for seven days and questioned by Mauritanian officers and by agents of the U.S. Federal Bureau of Investigation (FBI). Then the CIA transported him to a Jordanian prison with its extraordinary rendition program; he was held for eight months. Slahi said he was tortured by the Jordanians. After being flown to Afghanistan and held for two weeks, he was transferred to military custody and the Guantánamo Bay detention camp in Cuba on August 4, 2002. Slahi was subjected to sleep deprivation, isolation, temperature extremes, beatings and sexual humiliation at Guantánamo. In one documented incident, he was blindfolded and taken out to sea in a boat for a mock execution. Lt. Col Stuart Couch refused to prosecute Slahi in a Military Commission in 2003. He said that "Slahi's incriminating statements—the core of the government's case—had been taken through torture, rendering them inadmissible under U.S. and international law." In 2010, Judge James Robertson granted a writ of habeas corpus, ordering Slahi to be released on March 22. In his unclassified opinion, Judge Robertson wrote: "... associations alone are not enough, of course, to make detention lawful. "(p29) The Department of Justice appealed the decision. The D.C. Circuit Court of Appeals vacated the ruling and remanded the case to the District Court on November 5, 2010, for further factual findings. (p3) The District Court never held the second habeas hearing. On July 14, 2016, Slahi was approved by a Periodic Review Board for release from detention. Slahi was freed and returned to Mauritania on October 17, 2016; he was imprisoned at Guantánamo for over fourteen years. Slahi was an exceptional student in high school in Mauritania. In 1988, he received a scholarship from the Carl Duisberg Society to study in Germany, where he earned an electrical engineering degree from the University of Duisburg. In 1991, Slahi traveled to Afghanistan to join the mujaheddin fighting against the communist central government. The United States had supported the mujheddin against the Soviet occupation starting in 1979, and funnelled billions of dollars of weapons and aid to the "freedom fighers". After the Soviet withdrawal in 1989, there was a civil war between Mohammad Najibullah's government and the mujaheddin. Slahi trained for several weeks at the al Farouq training camp near Khost, which was run by al Qaeda, one of many mujaheddin groups in the civil war. At the end of his training in March 1991, he swore bayat to al Qaeda and was given the kunya (nom de guerre) of "Abu Musab." However, he did not participate in the civil war, instead he returned to Germany. In February 1992, Slahi traveled again to Afghanistan and was assigned to a mortar battery in Gardez. Six weeks later, the Najibullah regime fell and he returned to Germany. (p12) In hearings in Guantanamo, Slahi has stated that he traveled to Afghanistan twice, attended the al Farouq training camp, and fought against the Afghan central government in 1992, but that he was never an enemy combatant against the United States. (pp2–4)(pp4–6) In fact, he was fighting on the same side as the United States, which in 1992 supported the mujaheddin fight against the communist government in Afghanistan. Slahi's cousin and former brother-in-law is Mahfouz Ould al-Walid, also known as Abu Hafs al-Mauritania. Before the September 11 attacks in the United States, Al-Walid was a spiritual adviser to Osama bin Laden, was on the shura council of al Qaeda, and headed the sharia council. (p21) However, two months before the attacks, al-Walid, along with several other al Qaeda members, wrote a letter to bin Laden opposing the planned attacks. Al-Walid left al Qaeda after the attacks. Slahi moved to Montreal, Quebec, Canada in November 1999 because German immigration authorities would not extend his visa for residence in Germany. Since he was a hafiz, he was invited by the imam of a large mosque to lead Ramadan prayers. Ahmed Ressam, who was caught with explosives crossing the Canada–US border in December 1999 as part of the 2000 millennium attack plot, had attended the same mosque. Since Slahi was known to U.S. intelligence through contact with his cousin Mahfouz Ould al-Walid, he was suspected by them of activating Ressam. The Canadian Security Intelligence Service (CSIS) put Slahi under surveillance for several weeks but did not find any grounds to arrest him. According to a classified report of German intelligence, "there is not only no evidence of any involvement by Ould Slahi in the planning and preparation of the attacks, but also no indication that Ressam and Ould Slahi knew each other." Slahi left Canada on January 21, 2000, to return to Mauritania. During his trip home, Slahi was arrested in Senegal at the request of United States authorities and questioned about the millennium plot. He was transferred to Mauritania to be interrogated by local authorities and United States FBI agents. After three weeks in custody, during which Slahi was accused of being involved in the millennium plot, he was released. Slahi worked at various companies in Mauritania as an electrical engineer starting in May 2000. After the September 11 attacks, the U.S. renewed scrutiny of everyone suspected of having ties to al Qaeda. On September 29, he was again detained by the Mauritanian authorities for questioning. He cooperated with the authorities several more times and then for the last time starting on November 20, 2001. Slahi was interrogated by both Mauritanian officials and the FBI for seven days. Then the CIA transported him to Jordan using extraordinary rendition. The CIA supervised his interrogation at a Jordanian prison for eight months. Slahi claims he was torured and force to confess to involvement with the millennium plot. On July 19, 2002, the CIA transported Slahi to Bagram, Afghanistan, where he was transferred to military custody and held at the detention facility. The US military flew Slahi to Guantanamo Bay detention camp on August 4, 2002. Slahi was assigned detainee ID number 760 and was initially held in Camp Delta. Officials belonging to Canadian Security Intelligence Service interviewed Slahi in February 2003. He was among 14 men classified as high-value detainees, for whom the Secretary of Defense authorized use of what were called extended interrogation methods, which have since been classified as torture. By January 2003, US military interrogators pressed to make Slahi their second "Special Project," drawing up an interrogation plan like that used against Mohammed al-Qahtani. Declassified documents show that Slahi was transferred to an isolation cell near the end of May and abusive interrogation started. He was subjected to extreme cold and noise, extended sleeplessness, forced standing or other postures for extended periods of time, threats against his family, sexual humiliation, and other abuses. In February 2015, a series in The Guardian reported that one of his interrogators was Richard Zuley, a career homicide detective with the Chicago Police Department, who was called in on assignment with the US Navy Reserve. In Chicago, Zuley has been the subject of civil suits by inmates attributing similar abuse, including shackling, threats and coerced confessions. In September 2003, Slahi was moved to Camp Echo. Memos summarizing meetings held on October 9, 2003 and February 2, 2004 between General Geoffrey Miller and Vincent Cassard of the International Committee of the Red Cross (ICRC) acknowledged that camp authorities were not permitting the ICRC to have access to Slahi, due to "military necessity." Lt. Col V. Stuart Couch, a Marine Corps lawyer, was appointed as Slahi's prosecutor at Guantanamo. He withdrew from the case in May 2004 after reviewing it in depth. Couch said that he believed that Slahi "had blood on his hands," but he "could no longer continue the case in good conscience" because of the alleged torture, which tainted all confessions Slahi had made. Couch said that "the evidence is not believable because of the methods used to obtain it and the fact that it has not been independently corroborated." The Wall Street Journal published a letter that Slahi wrote to his lawyers on November 9, 2006. In the letter, Slahi said all his confessions of crimes were the result of torture. He laughed at being asked to recount "everything" that he had said during interrogations, joking that it was "like asking Charlie Sheen how many women he dated." According to Peter Finn of the Washington Post in 2010, Slahi, along with Tariq al-Sawah, were "two of the most significant informants ever to be held at Guantanamo. Today, they are housed in a little fenced-in compound at the military prison, where they live a life of relative privilege -- gardening, writing and painting -- separated from other detainees in a cocoon designed to reward and protect." Slahi started writing a memoir of his experiences in 2005, continuing into the next year. The more than 400-page manuscript was declassified by government censors in 2012 after numerous redactions. Excerpts were serialized in Slate magazine beginning in April 2013. It was published as a book, Guantánamo Diary, in January 2015. When he assumed office in January 2009, President Barack Obama repeated his commitment to close Guantanamo. He convened a six-agency task force to review the detainees and recommend those who could be released. In its 2010 report, the Guantánamo Review Task Force recommended Slahi be considered for prosecution in a military commission. The task force recommended that detainees deemed too dangerous to release, but without sufficient evidence for prosecution, receive a Periodic Review Board hearing. In 2013, Slahi was listed as one of 71 detainees eligible for a review. In March 2016, Slahi was granted a hearing before the Board in June. US District Court Judge James Robertson had issued an order to the Department of Defense barring them from interrogating Slahi while his habeas corpus case was under consideration. Guantánamo authorities in October 2014 seized all of Slahi's privileged legal papers and all his personal belongings, including a computer. They also stripped Slahi of his "comfort items," including letters from his late mother, in an attempt to force him to agree to interrogations. Slahi wrote in an unclassified letter to his attorneys in April 2015 that officials had offered to return these items if he agreed to interrogations, which had been barred for six years. Prosecutors in the case of Ahmed al-Darbi wanted to interrogate Slahi about him. Slahi was last interrogated by the Federal Bureau of Investigation on May 22, 2003. His FBI interrogator warned him "this was our last session; he told me that I was not going to enjoy the time to come." Three months later Defense Secretary Donald Rumsfeld approved the use of "enhanced interrogation techniques," which critics have characterized as torture. Slahi was subjected to isolation, temperature extremes, beatings, and sexual humiliation by military interrogators. In one incident, he was blindfolded and taken out to sea for a mock execution. On July 17, 2003, a masked interrogator told Mr. Slahi he had dreamed of watching detainees dig a grave.... The interrogator said he saw "a plain, pine casket with [Mr. Slahi's] identification number painted in orange lowered into the ground." In the summer of 2003, Slahi was repeatedly subjected to the use of an interrogation technique which the Schmidt-Furlow Report stated had been prohibited by the Secretary of Defense on December 2, 2002. What was not revealed until 2008 was that in a March 14, 2003, legal opinion memo issued by John Yoo of the Office of Legal Counsel, Department of Justice, to the General Counsel of the Department of Defense, Yoo advised that federal laws related to torture and other abuses did not apply to interrogations overseas. At that point the Bush administration contended that Guantanamo Bay was outside US jurisdiction. The Defense Department used this memo to authorize the use of enhanced interrogation techniques at Guantanamo and in Iraq. Also, by 2005, the New York Times reported that by an April 2003 memo from Rumsfeld to General James T. Hill, Rumsfeld authorized 24 specific permitted interrogation techniques to be used. Jack Goldsmith, head of the Office of Legal Counsel, withdrew the Yoo Torture Memos in June 2004 and advised federal agencies not to rely on them. Slahi's lawyers in 2008 threatened to sue Mauritanian, Jordanian, and US officials over his torture. The United States Senate Committee on Armed Services produced a report titled "Inquiry into the Treatment of Detainees in U.S. Custody" on November 20, 2008. It contains information about the treatment of Slahi and others at Guantanamo before 2005. In Rasul v. Bush (2004), the United States Supreme Court ruled that detainees at Guantánamo Bay detention camp had the right of habeas corpus to challenge their detention. Slahi had habeas petitions submitted on his behalf. In response, the Department of Defense published 27 pages of unclassified documents from his CSRT on July 14, 2005. The Military Commissions Act of 2006 mandated that Guantánamo detainees were no longer entitled access to the U.S. federal courts, so all pending habeas petitions were stayed. However, in June 2008, the Supreme Court ruled in Boumediene v. Bush that the MCA of 2006 could not remove detainees' right to habeas and access to the federal court system. All previous habeas petitions were eligible to be re-instated. Before submitting briefs in the habeas case, the U.S. government dropped its previous allegations that Slahi had participated in the Millennium Plot and that he knew about the 9/11 attacks before they happened. After review of the case, US District Court Judge James Robertson granted the writ of habeas corpus and ordered Slahi's release on March 22, 2010. Robertson's ruling was criticized by several GOP politicians. Slahi was the 34th detainee whose release was ordered by a federal district court judge reviewing government materials associated with his habeas petition. The unclassified decision was filed on April 9, 2010.
neither Al-Bihani nor any other case provides a brightline test for determining who was and who was not 'part of' al-Qaida at the time of capture. The decision, in other words, depends on the sufficiency of the evidence." In regard to Slahi's case, Judge Robertson wrote, "The question of when a detainee must have been a 'part of' al-Qaida to be detainable is at the center of this case, because it is clear that Salahi was at one point a sworn al-Qaida member. The Department of Justice appealed the decision. Oral arguments were heard on September 17, 2010, by a three-judge panel for the U.S. Court of Appeals for the D.C. Circuit. In oral arguments, Judge David Tatel questioned whether swearing bayat in 1991 is evidence of actions a decade and more later against the United States. He noted, "When he swore bayat, the United States and al-Qaeda had a common goal. Both the United States and al-Qaeda were opposing a communist government of Afghanistan." The panel discussed sending the case back to the District Court or over-ruling the decision, based on other recent D.C. Circuit rulings on the criteria that justify detention, which are still being developed. whether he remained "a trusted member" of al-Qaeda up to the time of his capture. In 2005, Slahi wrote a memoir while held in detention. The 466-page manuscript was in English, a language Slahi learned at Guantánamo. After litigation and negotiation, the US government declassified the memoir six years later, making numerous redactions. Excerpts were published by Slate magazine as a three-part series beginning April 30, 2013. On May 1, 2013, Slate also published a related interview with Col. Morris Davis, the military's chief prosecutor at Guantánamo from September 2005 to October 2007. The book, Guantánamo Diary, was published in January 2015. It is the first work by a still-imprisoned detainee at Guantánamo. It provides details of Slahi's harsh interrogations and torture, including being "force-fed seawater, sexually molested, subjected to a mock execution and repeatedly beaten, kicked and smashed across the face, all spiced with threats that his mother will be brought to Guantánamo and gang-raped." It has become an international bestseller. Prison officials prevented Slahi from receiving a copy of his published book. Filmmaker Kevin Macdonald (Last King of Scotland) is attached to direct the film adaption of Guantánamo Diary with actor Benedict Cumberbatch's company SunnyMarch attached as producer. Michael Bronner is writing the script. Slahi had his first Periodic Review Board review on June 2, 2016. A month later, the board recommended that Slahi be released. On October 17, 2016, Slahi was freed and returned to Mauritania, after being detained without charge for over 14 years. CBS News journalist Holly Williams traveled to Mauritania to interview Slahi. CBS News' flagship news show, 60 Minutes, broadcast the story on March 12, 2017. CBS News described it as Slahi's first television interview since his repatriation. In this interview Mohamedou said he "wholeheartedly [forgives] everyone who wronged [him] during [his] detention." Bravin, Jess (2013). The Terror Courts: Rough Justice at Guantanamo Bay. Yale University Press. ISBN 9780300191349. ^ "Mohamedou Ould Slahi - The Guantánamo Docket". www.nytimes.com. ^ a b c Rosenbach, Marcel (April 29, 2011). "Obtained Under Torture: Slahi's Guantanamo File Full of Dubious Information". Der Spiegel. Retrieved August 14, 2014. ^ a b Ackerman, Spencer (October 17, 2016). "Guantánamo Diary author Mohamedou Ould Slahi freed after 14 years". The Guardian. Retrieved March 7, 2017. ^ a b c Spencer Ackerman (2015-07-29). "Guantánamo detainee says his 'comfort items' were taken to force interrogations". New York City: The Guardian. Archived from the original on 2015-07-31. Retrieved 2015-07-30. Slahi alleged that the military "prosecuting team" pursuing confessed terrorist Ahmed al-Darbi "offered to help me on condition to ask the court to lift its order regarding my interrogation". ^ a b c d Flood, Allison (August 12, 2014). "Guantánamo prisoner to publish 'harrowing' memoirs". Guardian. Retrieved January 17, 2015. ^ a b c d Salahi v. Obama , 625 F.3d 745 (D.C. Cir. 2010). ^ a b c d e f "From Germany to Guantanamo: The Career of Prisoner No. 760". Der Spiegel. October 9, 2008. Retrieved August 14, 2014. ^ a b c d Worthington, Andy (April 21, 2010). "Mohamedou Ould Salahi: How a Judge Demolished the U.S. Government's Al-Qaeda Claims". Retrieved January 27, 2011. ^ a b c d e f g h i j Salahi v. Obama , 710 F.Supp.2d 1 (D.D.C 2010). mirror. ^ a b c Fisher, William (April 12, 2010). "Guantanamo Detainee Ordered Freed". Inter Press Service. Retrieved July 9, 2010. ^ a b c d Pickler, Nedra (September 17, 2010). "Appeals court: Once al-Qaida, always al-Qaida?". Seattle Times. Associated Press. Retrieved August 14, 2014. ^ a b Hsu, Spencer (September 17, 2010). "U.S. appeals court: How do you quit al-Qaeda?". Washington Post. Retrieved September 29, 2010. ^ a b Rosenberg, Carol (November 5, 2010). "Appeals panel upends judge's order to release Guantánamo captive". Standard.net. McClatchy-Tribune Information Services. Retrieved August 14, 2014. ^ Worthington, Andy (September 27, 2010). "The Betrayal of Mohamedou Ould Slahi". Future of Freedom Foundation. Retrieved August 14, 2014. ^ a b Savage, Charlie (21 July 2016). "Board Recommends Releasing Detainee Who Wrote 'Guantánamo Diary'". New York Times. Retrieved 5 August 2016. ^ a b c Cobain, Ian (January 16, 2015). "Guantánamo diarist Mohamedou Ould Slahi: chronicler of fear, not despair". The Guardian. Retrieved January 16, 2015. ^ "Cold War (1945-1991): External Course". The Oxford Encyclopedia of American Military and Diplomatic History. Oxford University Press. 8 January 2013. p. 219. ISBN 0199759251. ^ Tinti, Peter (February 26, 2015). "A Postcard from Guantánamo: How Mohamedou Ould Slahi Became a Suspected Terrorist, Then a Best-Selling Author". Vice. Retrieved March 16, 2016. ^ a b c d e Finn, Peter (March 24, 2010). "For two detainees who told what they knew, Guantanamo becomes a gilded cage". The Washington Post. Retrieved September 28, 2010. ^ a b c d "Combatant Status Review Tribunal transcript" (PDF). Wall Street Journal. Retrieved January 27, 2011. ^ a b c "Administrative Review Board Round One transcript" (PDF). Wall Street Journal. Retrieved December 29, 2015. ^ "Former Member Of Al-Qaeda Shura Council, Abu Hafs Al-Mauritani: 'I Advised The Americans… To Reach An Agreement With The Taliban'". Middle East Media Research Institute. October 19, 2012. Archived from the original on February 8, 2013. Retrieved August 14, 2014. ^ "Cracks in the Foundation: Leadership Schisms in al-Qa'ida from 1989-2006" (PDF). Combating Terrorism Center at West Point. September 2007. p. 18. Retrieved October 23, 2012. ^ 9/11 Commission (July 22, 2004). "The 9/11 Commission Report, Chapter 5" (PDF). pp. 165–166. ^ 9/11 Commission (July 22, 2004). "The 9/11 Commission Report, Notes" (PDF). p. 496, notes 89 and 90. ^ a b c "CSIS watched terrorist suspect in 1999". CBC News. October 3, 2001. Retrieved August 12, 2014. ^ Johnston, David (January 29, 2000). "Terror Suspect Is Rearrested In Africa at U.S. Request". New York Times. Retrieved January 26, 2011. ^ Roger, Olivier (September 29, 2001). "Mauritanian arrested in connection with Bin-Ladin's network". Mauritania. Radio France Internationale – via ProQuest: 82368037. ^ "Rendition – torture – trial? The case of Guantánamo detainee Mohamedou Ould Slahi". Amnesty International. September 20, 2006. Retrieved November 15, 2010. ^ Shephard, Michelle (July 27, 2008). "CSIS grilled trio in Cuba". Toronto Star. Retrieved August 12, 2014. ^ a b "The Guantánamo Memoirs of Mohamedou Ould Slahi, Part One: Endless Interrogation". Slate. April 30, 2013. Retrieved March 16, 2016. ^ "ICRC Meeting with MG Miller on 09 Oct 2003" (PDF). Washington Post. ^ "ICRC Meeting 2 Feb 2004" (PDF). Washington Post. ^ a b Scheer, Robert (April 16, 2007). "Leave Your Morals at the Border". The Nation. Retrieved September 28, 2010. ^ Horton, Scott (April 2, 2007). "Colonel with a Conscience". Harper's Magazine. Retrieved August 14, 2014. ^ a b Slahi, Mohamedou Ould (November 9, 2006). "Mohamedou Ould Slahi letter to his attorneys" (PDF). Wall Street Journal. Retrieved August 28, 2012. ^ Rosenberg, Carol (October 29, 2015). "U.S. repatriates long-cleared Guantánamo detainee to Africa". Miami Herald. Retrieved March 17, 2016. ^ "71 Guantanamo Detainees Determined Eligible to Receive a Periodic Review Board as of April 19, 2013". U.S. Department of Defense. Archived from the original on May 19, 2015. Retrieved May 18, 2015. ^ a b Hussain, Murtaza (March 15, 2016). "Mohamedou Slahi, Author of "Guantánamo Diary," to Get Hearing on Possible Release". The Intercept. Retrieved March 16, 2016. ^ Lieutenant General Randall Schmidt; Brigadier General John Furlow (June 9, 2005). "Investigation into FBI Allegations of Detainee Abuse at Guantanamo Bay, Cuba Detention Facility: Executive Summary" (PDF). US Department of Defense. Retrieved April 11, 2007. ^ a b Isikoff, Michael (April 4, 2008). "Justice: Torture Memo Fallout". Newsweek. Retrieved August 14, 2014. ^ a b Rosen, Jeffrey (September 9, 2007). "Conscience of a Conservative". New York Times. Retrieved August 12, 2014. ^ "A Guide to the Memos on Torture". New York Times. 2005. Retrieved January 16, 2015. ^ Champagne, Noiselle (March 10, 2008). "Mauritanian was tortured in Guantanamo - lawyers". Reuters. Retrieved August 14, 2010. ^ OARDEC. "Publicly Filed CSRT Records" (PDF). United States Department of Defense. pp. 1–27. Retrieved November 12, 2010. ^ Pelofsky, Jeremy (March 23, 2010). "U.S. judge orders release of Guantanamo detainee". Reuters (U.K.). Retrieved July 3, 2010. ^ Crabtree, Susan (March 24, 2010). "GOP denounces terror suspect release". The Hill. Retrieved July 8, 2010. ^ Rosenberg, Carol (March 3, 2010). "Judge orders release of detainee abused at Guantánamo". Miami Herald. Retrieved July 9, 2010. ^ a b Denniston, Lyle (November 5, 2010). "Caution urged in detainee cases". SCOTUSblog. Retrieved November 20, 2010. ^ Slahi, Mohamedou (April 30, 2013). "Guantánamo Memoirs: Part One". Slate. Retrieved January 17, 2015. ^ Siems, Larry (May 1, 2013). "He Reminded Me of Forrest Gump". Slate. Retrieved January 17, 2015. ^ "Blame game: After years of legal wrangling, Mohamedou Ould Slahi's prison diary finally comes out. A sad and sickening read". The Economist. 31 Jan 2015. Retrieved 7 February 2015. ^ "Ex-Gitmo detainee on torture: "They broke me"". 60 Minutes. 2017-03-09. Retrieved 2017-03-08. Now, in his first television interview since being released last October, he tells his remarkable story on 60 Minutes. ^ "A Guantanamo Guard And His Detainee Reunite". NPR.org. Retrieved 2019-03-28. Welna, David (January 4, 2016). "'Forever Prisoner' Writes Book About Guantanamo; He's One Of 107 Still There". NPR. Retrieved January 5, 2016. "Inside the U.S. Torture Chambers: Prisoner's Guantánamo Diary Details 12 Years of Abuse, Terror". Democracy Now!. January 22, 2015. Archived from the original on January 22, 2015. Includes interviews with Morris Davis, Nancy Hollander (Slahi's lead lawyer), and Larry Siems. Includes transcript, audio, and video. Siems, Larry (April 30, 2013). "The Guantánamo Memoirs of Mohamedou Ould Slahi: How the United States kept him silent for 12 years". Slate. Archived from the original on May 1, 2013. Siems, Larry; Kirk, Chris (April 30, 2013). "A Timeline of Detention". Slate. Retrieved August 14, 2014. Covers 2000 to 2010. "Torture at Guantánamo: Lt. Col. Stuart Couch on His Refusal to Prosecute Abused Prisoner". Democracy Now!. February 22, 2013. Retrieved January 17, 2015. Bravin, Jess (February 11, 2013). "'Imagine the Worst Possible Scenario': Why a Guantánamo Prosecutor Withdrew From the Case". Atlantic. Retrieved January 17, 2015. Hanna, Mike (September 9, 2011). "Fate of Guantánamo detainee still uncertain". alJazeera.com. Retrieved August 29, 2012. Siems, Larry (March 23, 2011). "Chapter 5, Part 4 - The Battle Lab : Endgame". TheTortureReport.org. ACLU National Security Project. Retrieved August 29, 2012. Siems, Larry (January 21, 2011). "Chapter 5, Part 3 - The Battle Lab : Force Drift". TheTortureReport.org. ACLU National Security Project. Retrieved August 29, 2012. "Mohamedou Ould Slahi Challenges Guantánamo Detention: Salahi v. Obama". American Civil Liberties Union. November 5, 2010. Retrieved 29 August 2012. Worthington, Andy (September 28, 2010). "Heads You Lose, Tails You Lose: The Betrayal of Mohamedou Ould Slahi". andyworthington.co.uk. Retrieved September 29, 2010. Wittes, Benjamin (September 15, 2010). "Why Salahi Is Important". LawfareBlog.com. Retrieved September 29, 2010. "The Slahi File" (PDF). Miami Herald. Retrieved November 5, 2010. United States Senate Committee on Armed Services (November 2, 2008). "Inquiry into the Treatment of Detainees in U.S. Custody". The New York Times. Retrieved September 21, 2010. Colson, Deborah; Cover, Avi (April 2008). "Tortured Justice: Using Coerced Evidence to Prosecute Terrorist Suspects" (PDF). Human Rights First. Archived from the original (PDF) on September 28, 2010. Retrieved September 29, 2010. "Double Jeopardy". Human Rights Watch. April 7, 2008. Retrieved October 1, 2010. "Mohamedou Ould Slahi - The Guantánamo Docket". New York Times. Retrieved March 16, 2016.